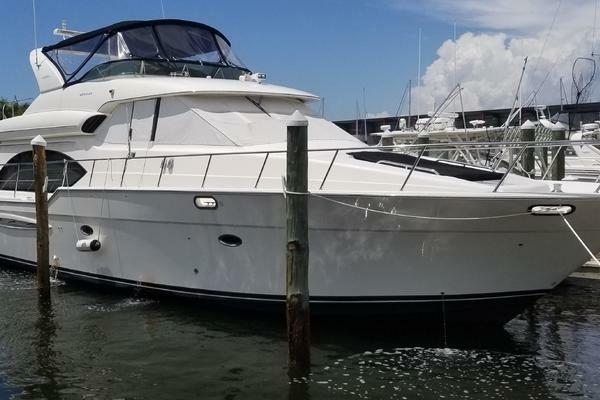 Meridian Yachts are widely known as one of the most popular builders of sedan bridge yachts and pilothouse yachts, owned by the Brunswick corporation who also own Sea Ray. United sells multiple used Meridian Yachts every year and has the expert team on staff to help guide you through the purchase process. Established as being one of the most popular bridge boat brands in the world, Meridian Yachts is a market leader in designing boats that deliver livability, cruisability, and comfort along any voyage you may take. This brand does not only offer exceptional value to its customers, it also is frequently awarded the NMMA’s Marine Industry CSI award, making this fleet stand out from the rest. 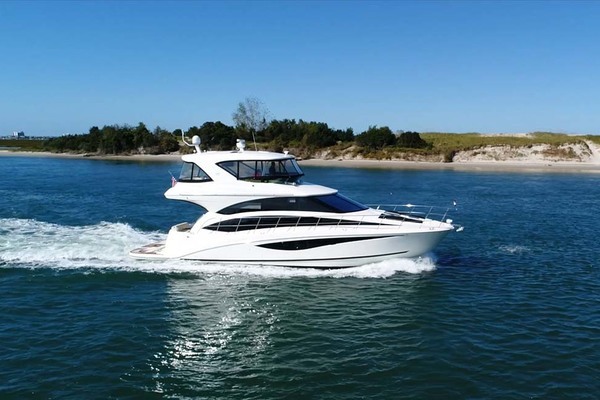 With its headquarters located in Knoxville, Tennessee, Meridian Yachts is another branch of the Sea Ray Group within the Brunswick Boat Group. Built with exceptional care and craftsmanship, the Meridian fleet offers the utmost quality and value in all its elements, whether that is its state-of-the-art technology or its smart minded layout. The world of Meridian Yachts reflects the deep understanding of a boaters’ needs and is constructed to handle every component – durability, liveaboard comfort, and cruising powers. No matter what the conditions, Meridians are known to be reliable, each coming with a 1-5-10 Warranty, 10 year structural hull-and-deck Express limited Warranty, as well as a 5-year Express Limited Warranty against hull blistering. This brand caters to its customers, and knows the true meaning of owning a yacht – making them in a class all its own. By simplifying the streamlining vessel control and maneuverability, Meridian’s can convey the most comfortable cruising venture on the water. Characterized with standard bow and stern thrusters, Meridian has taken the extra step to use the Integrated Vessel control system to link those elements for single-handed operation. Another advanced feature is the Zeus system, from Cummins-MerCruiser Diesel – offering fuel efficiency and low speed maneuverability. It allows the captain to easily dock in close quarters and perform smooth movements throughout the whole ride. Not only do Meridians exceed the expectations for the industry, but also for those that truly know what it means to own and maintain a yacht. The 580 is not only a masterpiece, but is one of the most highly southout after pilothouse yachts in the industry. Offering extraordinary comfort and ample space, the atmosphere that the 580 possess is cool, calm, and collected. 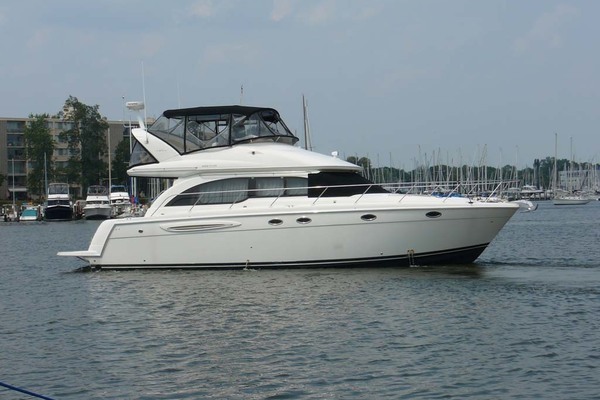 With an extensive list of luxury amenities, this impressive vessel is perfect for any family outing on the water. Detailed with a full beam master stateroom and impressive salon – this boat is a long way from being a poser’s boat. 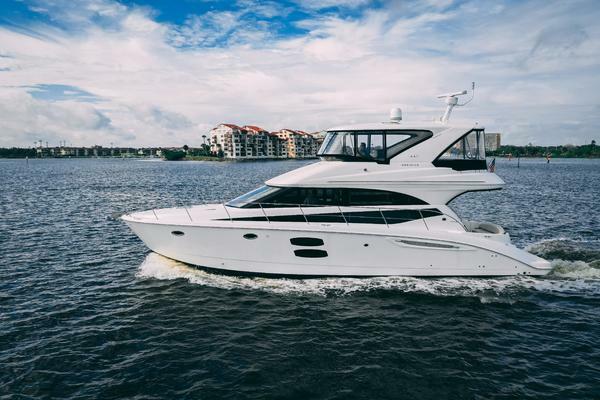 The pilothouse gives top vision in every direction with a flybridge that includes beautiful seating and helm with high quality companion seating. Teak looking material on the aft-deck and swim platform offer effortless details that makes this vessel top of the line. Because the salon superstructures, doors, window frames, and pilasters are all made of aluminum, it offers a low center of gravity and steers away from leaks or cracks in the windows. This capable vessel also includes a custom mahogany decked salon and galley built for those who appreciate comfort and durability. The dinette sits forward, providing excessive space dotted with a lot of leather, dark cherry timber and veneer, and excellent joinery. 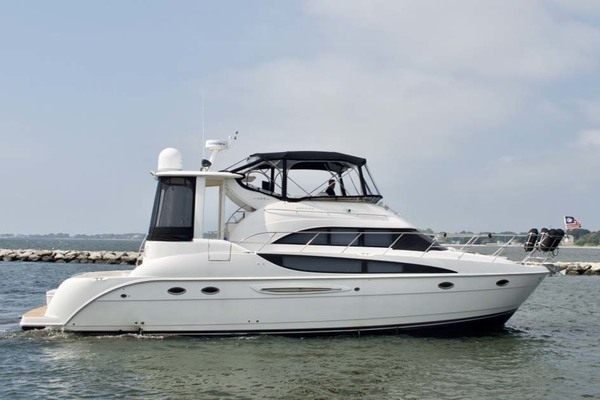 The 580 is vacation ready by providing cruising speeds and livable conditions. Influenced by European design, the 541’ Meridian Sedan Bridge still captures the American look by keeping abundant, usable space a priority. Often praised as being a model to other 55’ yachts, the Meridian Sedan Bridge provides elegance and comfort with numerous features that are easily maintained. The huge cockpit and teak swim platform adds another element of fine design, in addition to a galley aft window that opens to a cockpit bar with partnering stools. The elongated windows and tall ceilings provide an inviting space – great for entertaining any kind of party. The split window design provides water views visible for all guests seated throughout the interior areas. The flybridge, which is fully enclosed, does not disappoint either with its abundant space. Reaching up to 34 mph, the sedan cruises best around 24 mph and 2000 rpm making it a smooth ride. 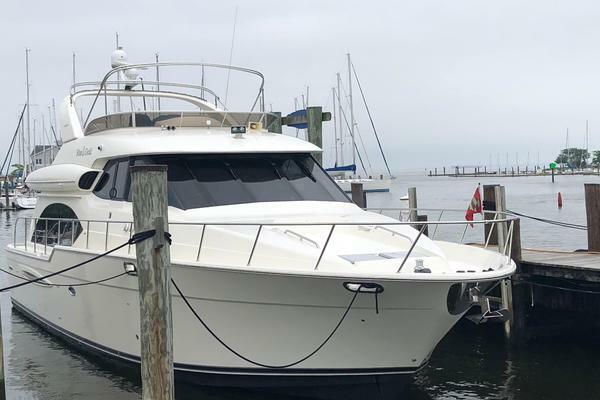 Additionally the 54’ includes a two head layout with a full beam master, washer/dryer, and electrical room situated under the galley – providing easy access to its electrical systems. The Zeus Pod Drives, which Meridian’s are known for, provides fuel efficiency and easy flexibility providing a great experience anyone on board the 54’ sedan. Built with innovation and creativity in mind, the 441 Sedan Bridge was developed to feature Meridian’s team of naval architects new hull, deck, bridge, and shearline. These new designs feature aggressive elements with new hull-side windows for the guest stateroom, accessible bridge access, abundant space to bring in that natural light, as well as beautiful new woodwork. The wide-open floorplan creates a sense of fluidity throughout the whole cabin providing unbroken lines of sight between the salon, the dinette, and fully stocked galley. Furthermore, Meridian has polished up its signature integrated two-tier window system to ensure visibility is a priority from the inside, making this yacht excel from the rest of its fleet. Methodically planned, the two-stateroom, two-head layout provides an accommodating master suite situated forward with a queen-sized berth and pillow-top mattress allowing the ultimate sleep on the water. In addition, the guest stateroom also provides great comfort featuring a double berth that can make this vessel perfect for a weekend getaway. Meridian always has a knack for knowing what their customers wish to have inside their boat, which they have demonstrated throughout the whole vessel. A joy to handle underway, the 44’ lets you have total control by linking both the bow and stern thrusters with the engine shifters. It’s very easy to admire a boat like a Meridian, and the 44’ is no exception.